Invasive plant and animal species have had devastating impacts on the native ecology of many natural areas and are one of the greatest threats to biodiversity in our world today. They also have significant impacts on our economies and can be a concern for human health. When a non-native, invasive species is introduced into an ecosystem, it can spread rapidly, out-compete native species and compromise natural habitats and processes that native species depend on for survival. In Stanley Park, there are 72 non-native, invasive plant species. The management of these species is a priority for SPES – with the goal of conserving and restoring the natural ecosystems, habitats and species present in the park. decommissioning unsanctioned trails, and adding course woody debris and other enhancements. Educate the public about the impacts invasive species are having on our environment and how to mitigate these impacts. Provide volunteers with a fun, empowering and rewarding opportunity to contribute to the conservation of biodiversity. 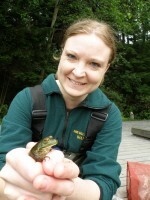 Mapping of invasive species in Stanley Park is a key priority for SPES. Many of the invasive species in the park have been mapped by volunteers using Global Positioning and Geographic Information Systems. This mapping allows SPES to assess the impacts of invasive species, plan and coordinate our management actions, and monitor the results of our invasive species management programs. Updated mapping of invasive species in Stanley Park was completed in the fall of 2011 and will continue as needed. Please see our mapping page (coming soon) for current map layers. When English ivy (Hedera helix) climbs trees and other structures, its form of growth changes and begins to produce fruits and seeds. Ivy seeds may be eaten by bird and mammal species or simply fall to the ground, facilitating both short and long distance dispersal. To slow and stop the further spread of ivy in Stanley Park, it’s important to reduce and eliminate the production of ivy fruit and seeds. In the spring of 2009, SPES initiated a tree ivy management program whereby volunteers document and remove ivy growing up vegetation and other structures in the park. The goals of this program are to slow the spread of ivy in the Park and beyond, thus reducing its impact on natural ecosystems, and to protect and restore the functions of native species and structures.